Today only these Twisted Root Design Print Hammocks is just $9.99 (Reg. $59.99) at Woot.com! Shipping is FREE for Amazon Prime Members or only $5 flat rate. 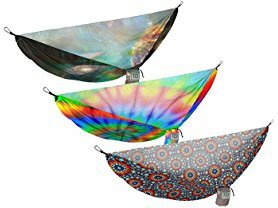 You're distinct, unique, and bursting with personality and now so is your hammock! Show off your character and color through our new line of awesome Twisted Printed Hammocks. Oversized seamless single-panel construction for a more comfortable hang. Compact design makes it easy to carry on all your adventures. Includes steel carabiners with threaded safety gate. Attached stuff sack for quick easy storage. Stuff Sack Dimensions: 7" x 4.25"